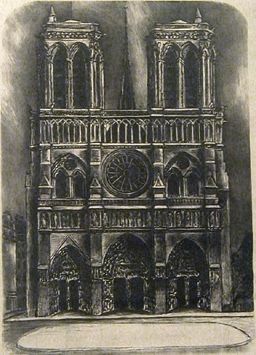 Ernest Fiene Lithograph "Notre Dame"
Dimensions: 15 3/8 x 10 7/8 in. Paper and printing techmique: At least some impressions from the edition of this lithograph are printed on chine collé. This technique was a favorite with Fiene's Paris printer Edmond Desjobert. Japan paper was used for some if not all of the edition, chine-collé impressions and otherwise. **Annotations The chine collé impressions are generally signed on the backing sheet just below the pasted top sheet, but not always. The MoMA impression of Notre Dame, for example, is printed on chine-collé but signed on the top sheet. The impressions that are not chine-collé are signed just below the image in the usual fashion. Gallery reference and Provenance: The BIAA, PhMA impressions and one of the SAAM impressions of Notre Dame were gifts from Edith Halpert, proprietor of the Downtown Gallery in New York. Impressions from the Downtown Gallery generally bear one or more of its gallery stamps on the reverse.